This project is our own development. We live and work here. The block occupies a corner and the house and studio each have their own entrances while facing each other across a garden. Like most architects’ houses the change has been incremental, the most recent being the addition to the house of two new upstairs bedrooms, a bathroom and a renovation to the kitchen in 2017. In that round of work we re-used a lot of the materials that were part of the earlier ‘make-good’ work that was done when we first moved in. Doors, decking, joinery, benchtops, lighting, roofing and timber framework were all recycled into the latest incarnation. 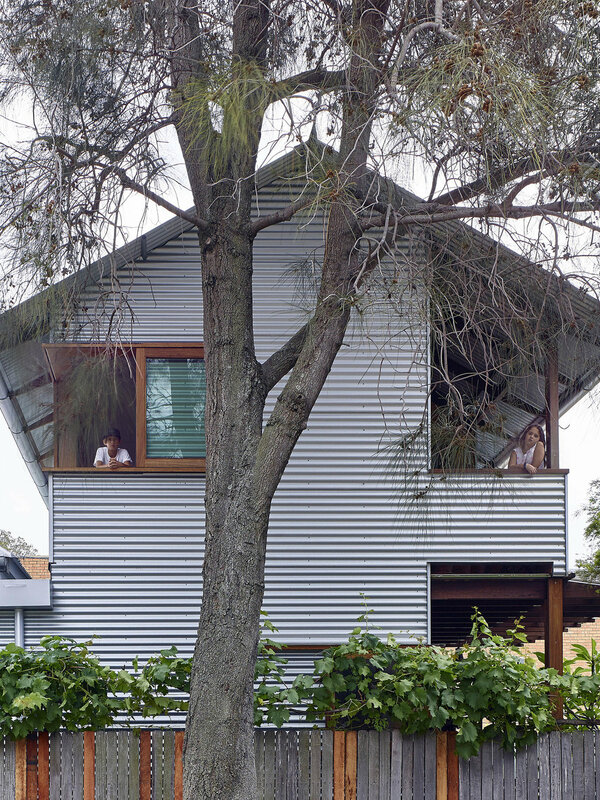 The studio building was shortlisted in the 2010 Australian Institute of Architects awards. "The idea is that a building doesn't have to flag itself as sustainable; it should look like a good piece of architecture. And a good piece of architecture should be sustainable." "Their house and work studio could well be an exemplar of a future... where commutes for work are nil, a vegetable garden serves both home and office and a sustainable ethic of 'we can do less' governs every aspect of work and living."